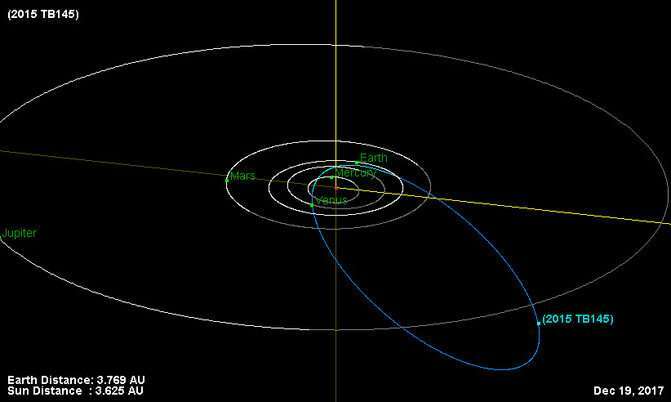 There is one year to go until asteroid 2015 TB145 approaches Earth once again, just as it did in 2015 around the night of Halloween, during which astronomers studied its characteristics. This dark object measures between 625 and 700 metres; its rotation period is around three hours. In certain lighting conditions, the asteroid resembles a human skull. It zipped past on 31 October 2015, relatively close to Earth, just 486,000 km away, 1.3 times the distance to the moon. The asteroid was discovered a few days earlier, on 10 October using the Pan-STARRS telescope in Hawaii. Different teams of astronomers pointed their instruments towards 2015 TB145, including NASA, which captured it using the Green Bank Radio Telescope in West Virginia and Arecibo Radio Telescope in Puerto Rico. 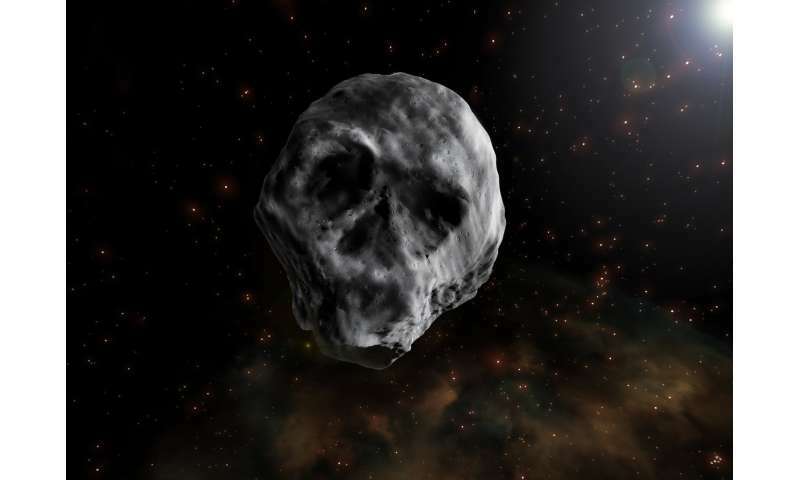 In some of the images, the rotating asteroid was seen at times to resemble a human skull due to the lighting conditions at particular moments during its rotation. European scientists, including the researcher Pablo Santos-Sanz from the Institute of Astrophysics of Andalusia (IAA-CSIC), also organised observing campaigns of the Halloween asteroid to discover its characteristics. The results have been published in the journal Astronomy & Astrophysics. "It is an Apollo-type near-Earth asteroid (NEA)," Santos-Sanz explains. "The proximity of this small object meant greater brightness, so we decided to study it using various observation techniques: on the one hand, we used optical telescopes from the Sierra Nevada Observatory in Granada, the Calar Alto Observatory in Almería and the La Hita Observatory in Toledo; and on the other, we analysed it in the mid-infrared using the Very Large Telescope (VLT) VISIR instrument at the European Southern Observatory (ESO) in Cerro Paranal, Chile." "From the observations from Spain, we discovered that this object's most likely rotation period is 2.94 hours, in other words, this is the approximate length of its day, although we cannot rule out another possibility: 4.78 hours, another solution which is consistent with our optical data," the expert points out. Thanks to the observations in the mid-infrared made from the VLT, the authors were able to detect the thermal emission of the object. Using this information and a thermophysical model, various properties of 2015 TB145 could be discerned. Santos-Sanz mentions a few of these: "The object measures between 625 m and 700 m, its shape is a slightly flattened ellipsoid, and its rotation axis was roughly perpendicular to the Earth at the time of its closest proximity. Furthermore, its thermal inertia (the amount of heat which it retains and the speed at which it absorbs or transfers heat) is consistent with that of similar sized asteroids." The reflectivity or albedo of the surface of this asteroid is around 5 or 6 percent, which means that it reflects approximately 5 to 6 percent of sunlight. "This means that it is very dark, only slightly more reflective than charcoal," the Spanish astrophysicist explains. Researchers are confident of obtaining more data on 2015 TB145 the next time it approaches our planet, which will happen in November 2018, although this time it will zip past much further away than the last, at a distance 105 times the average lunar distance. "Although this approach shall not be so favourable, we will be able to obtain new data which could help improve our knowledge of this mass and other similar masses that come close to our planet," Santos-Sanz says. "It is currently 3.7 astronomical units away from Earth, that is 3.7 times the average distance from the Earth to the Sun," he points out. "It has a magnitude of 26.5, which means it is only visible from Earth using very large telescopes or space telescopes." Thomas G. Müller, researcher from the Max-Planck-Institut für extraterrestrische Physik (Germany) and co-author of the study, says, "The next slightly more exciting encounter will be around Halloween's day in the year 2088, when the object approaches Earth to a distance of about 20 lunar distances. The encounter on Halloween's day 2015 was the closest approach of an object of that size since 2006, and the next known similar event is the passage of 137108 (1999 AN10) on August 7, 2027. Later, 99942 Apophis will follow on April 13, 2029 with an Earth passage at approximately 0.1 lunar distances." Scientists think that the Halloween asteroid could, in fact, be an extinct comet that lost its volatile compounds after orbiting the sun numerous times. In general, asteroids and comets are distinguished by their composition (the former being more rocky and metallic, while the latter have a higher proportion of ice and rock) and type of orbit around the sun, but at times it is not easy to tell them apart. The boundaries between them are becoming increasingly diffuse. In any case, both were formed and witnessed the first stages of our solar system, which was born around 4,600 million years ago.